Your teen is unique. Their treatment should be, too. That’s why Invisalign® clear aligners use the most advanced technology to uniquely design a treatment around your teen to reveal their best smile. Plus, your teen is 2x more likely to have higher self-esteem throughout treatment when compared to braces, giving them a better overall experience. In the hands of an experienced orthodontist, Invisalign clear aligners can be used to treat simple to complex teeth straightening cases on teens. Invisalign teen patients have much better hygiene compared to teen patients in braces and do not develop white spot lesions. Your teen can continue to enjoy the things they love, from their favorite foods to sports, all with less pain than braces. Throughout treatment, neither of you have to worry about injuries from wires or brackets, as well as unexpected trips to the doctor because of broken ones. Invisalign Teen patients require less frequent visits to the office compared to teen patients in braces. Appointment times are generally shorter as well. Invisalign patients have much better hygiene compared to patients in braces and do not develop white spot lesions. Invisalign is more comfortable than braces. Invisalign patients have very few emergencies. Emergencies can happen with braces (Broken brackets, poking wires during summer vacations or while traveling. Invisalign patients have no food restrictions. Patients in braces must avoid many foods. Invisalign patients require less frequent visits to the office. Invisalign is much less visible for social events such as Prom, senior pictures, weddings. What are Invisalign Treatment Requirements? Invisalign trays MUST be worn for minimum of 22 hours (FULL-TIME wear is required). Aligners must be taken out before eating or drinking any beverages other than water. 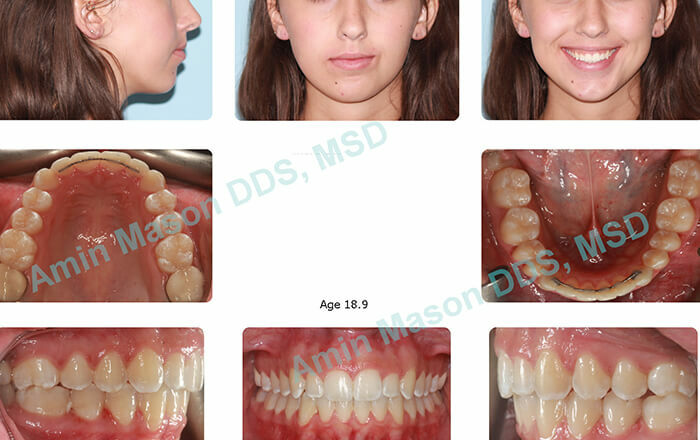 Patient did not want any metal braces, crowded upper and lower arches, increased overbite and overjet. 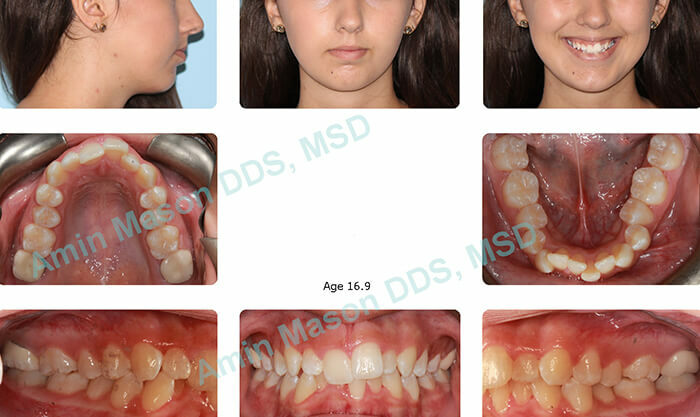 Treatment: Patient was treated by Invisalign Teen system.